"A quick, light-tasting dessert. Great to have around the home during the holidays!" Preheat oven to 375 degrees F (190 degrees C). Line an 8-inch square baking dish with parchment paper or aluminum foil, leaving a 2-inch overhang. Butter sides and bottom of paper. Stir butter and sugar together in a bowl until sugar is completely dissolved. Stir graham cracker crumbs into butter mixture; press mixture into the bottom of the prepared baking pan. Bake in the preheated oven until edges are lightly browned, 4 to 5 minutes. Cool completely. Stir condensed milk, white chocolate chips, and white chocolate together in a large saucepan over medium heat until white chocolate is completely melted. Remove saucepan from heat and stir lime juice and lime zest into chocolate mixture. Pour mixture over cooled crust, cover with plastic wrap, and chill in the refrigerator for at least two hours or overnight. Lift fudge from pan using the overhanging paper and cut into desired shapes. Store in a container in the refrigerator. It tastes great! I used 1 and 1/4 packages from 1 box. I used 2 packages before I realized this, and used WAY too much. It was still delectable! 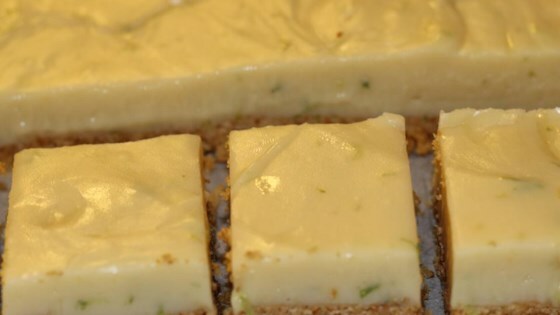 Key lime fudge for sure! This recipe is delicious--but I recommend using all chips or all bars for convenience; I hate buying two different kinds of the same thing! Very yummy! Reminded me more of a bar than fudge...probably because of the graham cracker crust. Tastes like Key Lime Pie bites.